Rare plant with a rotten fish smell spotted in Tambunan | Daily Express Online, Sabah, Malaysia. Tambunan: A flowering plant that can grow up to 3.5 metres, one of the world's largest species, has been spotted here, NST reports.The Amorphophallus titanum, also known as titan arum, boasts a stunning flowering structure which is accompanied by the putrid scent of rotting flesh. Usually found in Indonesia and known as Bangkai Raksasa, Kampung Kuyungon villagers here said the plant was also known as Lopung-Lopung. 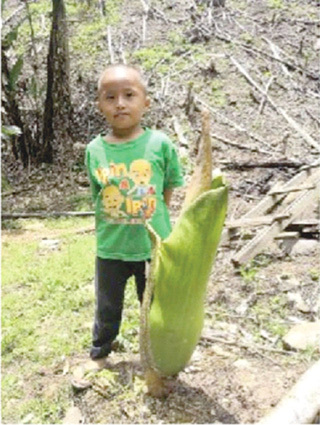 Mairinc Patrick said two weeks ago, her family spotted the huge plant at their farm which grew to the height of her 5-year-old nephew. "We have seen the plant before, but at that time, it was about a metre tall. "The stem of the lupong-lupong will be the only part that grows at the initial stage and only later will the leaf come out," she said, adding some locals said the plant was edible. Mairinc added the plant will have pungent smell when it dies after about two weeks. Netizens have also claimed to have seen the species grow behind their houses. District officer Thomas Logijin when contacted said there were reports of new discoveries of titan arum plants growing in other parts in Tambunan. According to website www.arkive.org, the titan arum lives in the rainforests of western Sumatra, on steep hillslopes that are between 120 and 365 metres above sea level. The species is classified as Vulnerable (VU) on the 1997 IUCN Red List of Threatened Plants. The deforestation of the Sumatra rainforest affected titan arum numbers directly, and the situation also impacted the rhinoceros hornbill, an important seed distributor for such plant species.